For nearly 80 years, the small skylights sat in perpetual darkness, slowly turning purple within the Rotunda roof. The skylights were part of the plan created by architect Stanford White, of the firm McKim, Mead and White. He redesigned the Rotunda after its near total destruction by fire in 1895, adding various classical details to the building that were characteristic of the Beaux Arts style popular at the time. Along the exterior base of the Rotunda’s dome were his skylights—20 concrete “windows” within arched frames, set with round glass panes. The idea was for the ring of skylights to refract light throughout the Dome Room, below the oculus. But there was not enough time or money to cut through the ceiling of the inner dome for the skylights to shine through, so they were covered with copper and remained, half-finished, within the roof for decades. In the mid-1970s when the Rotunda went through its next major renovation, workers uncovered the skylights and removed them, leaving the debris beneath the roof’s concrete steps. 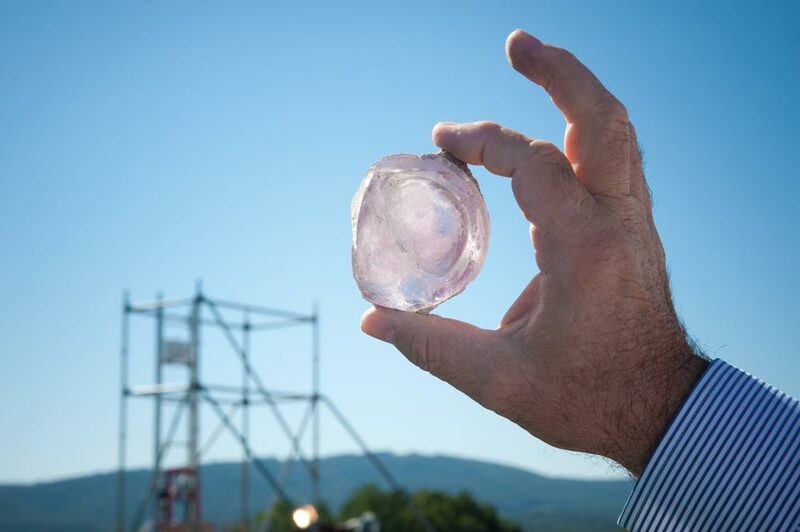 On a fall day nearly 40 years after the last major Rotunda renovation was completed, Stephen Ratliff (Col '79), the acting academic division director of facilities management, holds a piece of a skylight glass, lavender colored from years in the dark, in his hand. Ratliff is overseeing the construction of Phase One of the current $51.6 million renovation of the Rotunda. When workmen removed the lower two steps on the Rotunda roof to facilitate repairs this summer, they found other relics from past restorations: pieces of tile from the White-designed dome that was constructed after the 1895 fire and soda bottles and beer cans left behind by workers who helped renovate the Rotunda in the 1970s. Like the changing architecture of the Rotunda itself, the debris from previous renovations tells a story. Part of the Rotunda's powerful presence stems from its history and age—it turns 200 in 2026. But there comes a point when the patina of history turns to deterioration. The roof leaks, the column capitals are crumbling, the window casings are pulling away from points of attachment, and rust is encroaching on the steel tension rings that senior historic preservation planner Brian Hogg (Col '83) says "help contain the thrust of the dome so the walls don't explode." 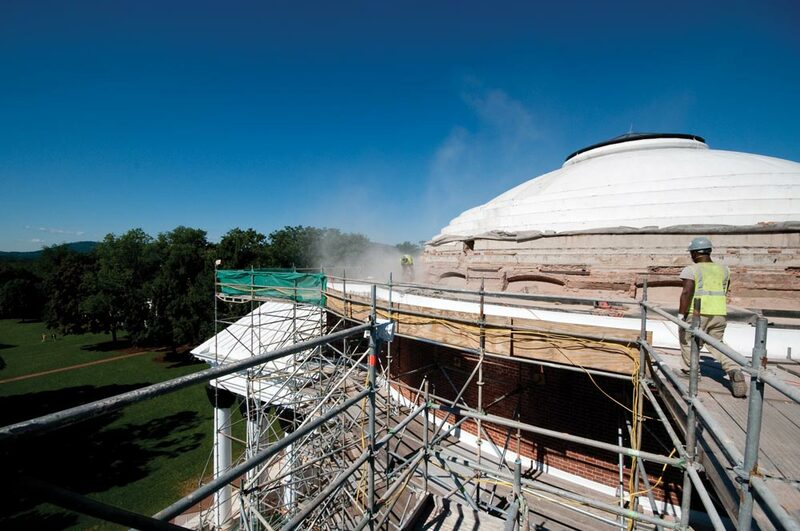 Phase One of the current renovation, now underway, addresses the Rotunda's exterior: replacing the leaking roof, stripping and repairing windows, repointing masonry and stripping and repairing ornamental work. "Everything that we're doing is to maintain the structure—by that I mean both its historic fabric and architectural intent, but also the integrity of the structure as a physical edifice," says David Neuman, Architect for the University. "So you start with the roof … you've got to make sure the building isn't leaking before you can do anything else." 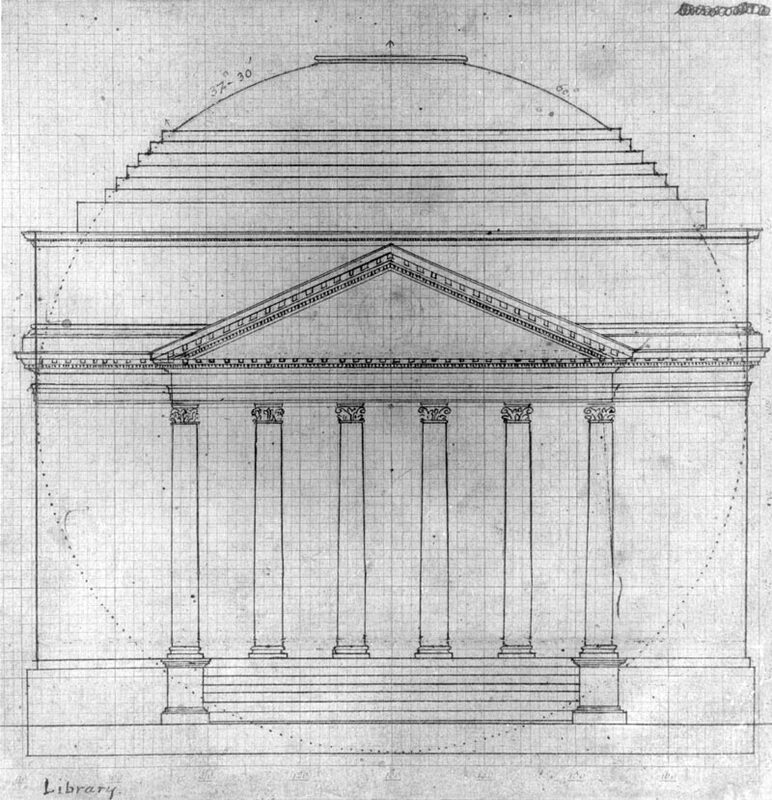 The rub is that when a decision is made to start a major renovation, all questions of Jefferson's intentions for the Rotunda come head-to-head with modern construction techniques. 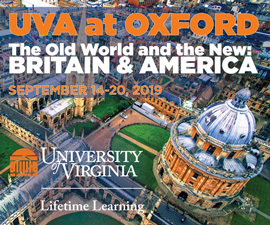 The Rotunda is subject and symbol of the University's evolving ideals, going through a sort of architectural Darwinism over its almost 200 years of existence. "There's been a lot of change," Neuman says. "A lot of people walk up [to the Rotunda] and they think this is all Jefferson. It's Jefferson's idea and spirit, but a lot of what you're looking at is not Jefferson." The roof provides a good example of the Rotunda's changing appearance. The original 1826 tin-coated shingles oxidized to a chalky white, but "very early on the roof started changing colors because it leaked so badly," says Hogg. "It was painted with a red oxide paint. It was covered with black tar." At different times cupolas were erected to deal with leaks over the oculus. Then came the 1895 fire that completely destroyed the original dome. 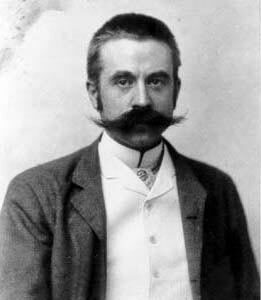 The Stanford White-designed dome, as mandated by the Board of Visitors, had to be fireproof. It was constructed using what is called the Guastavino tile method, creating self-supporting arches through interlocking terra-cotta tiles, and covered with copper, which oxidized to green. The green copper roofing was replaced by white-painted steel roofing in 1975, although the Guastavino tiles remained. The current roof renovation will include replacing the existing steel roofing with copper roofing that will be painted white, as was originally intended by White in 1898. It also includes making minor repairs to the tile system beneath. "It's hard to say if there was ever a day when Jefferson's vision for this place, physically anyway, ever existed, because the change was so constant," says Hogg. "The roof on this building has been a problem from the day it was finished. One of our consultants said a couple of years ago that the one thing this current roof and Jefferson's original roof had in common was that they leaked from the day they were installed. And we're hoping not to repeat that." One of the best resources that conservators have in their quest to avoid previous renovation missteps is the Historic Structure Report (HSR), a comprehensive history that begins with the Rotunda's construction, includes renovations throughout the years, and ends with an assessment of the building's current condition. 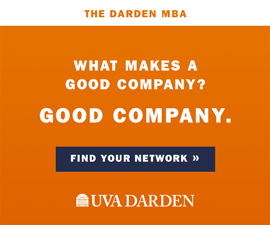 The HSR is the result of an exhaustive study initiated in 2005 by the Office of the Architect, Facilities Management and UVA senior management. It is a story of evolution, guesswork and multiple points of view, with uncertainty and progress going hand-in-hand. The HSR (available here) may be the best way to share with the University community the blood, guts and heart of the venerable building because, ironically, once the current renovation is complete, most visitors will not be able to tell what has changed. The general external appearance of the Rotunda will be very similar to the 1976 renovation. Currently, however, the Rotunda is a work in progress. Scaffolding surrounds the drum, power tools whine, workers in hardhats appear and disappear behind the dark green plywood walls of the construction zone, and students and visitors follow winding paths through it all, especially on the east side, where the construction elevator and scaffolding stairways give workers access to the upper levels and roof. Neuman hopes students are excited rather than disappointed to live through the renovation. "During the school year we just have to say, in the end, I hope everybody feels that we're doing the right thing. They should feel—I hope—proud to be here at this point in time." Throughout the Rotunda's history, there's been a subtle yet persistent element of the unfinished, of unrealized potential. Take, for example, White's dormant skylights; the abandoned architectural drawings of the McDonald Brothers of Louisville, Ky., the architects first hired to restore the Rotunda after the 1895 fire, who were replaced by McKim, Mead and White; and Jefferson's plan to turn the ceiling of the Dome Room into a planetarium with a pulley-operated oak boom from which a daring astronomy professor would lecture the students below (see Retrospect). This sense of unrealized potential remains perceptible to this day. The Rotunda plays a limited role in the activities of current students. Instead, it is home to Board of Visitors meetings, ceremonial dinners, doctoral defenses and administrative offices. It is a building that students walk past almost every day, but rarely enter. As the Rotunda renovation continues, many are considering ways that the building can play a larger part in academic life. 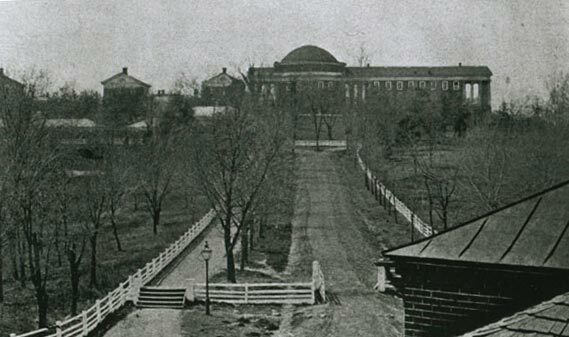 "For Jefferson, it was the unification of all, the center of campus, the library, and as such, the Rotunda is the Mind of the University," says Richard Guy Wilson, a professor of architectural history and expert on the Academical Village. "The Rotunda is also, in a sense, [the University's] skull." Wilson and others hope to return a figurative "brain" to the skull, as it was in the days when the old Rotunda library buzzed with student activity. "The Rotunda has become the primary symbol and logo of the University, and in many ways that is appropriate," Wilson says. "The problem is that the damned thing isn't used for anything." Over the past year, Neuman chaired a committee related to programming alternatives that could be considered for the Rotunda after the renovation is complete. This fall, he presented possible future uses to the Board of Visitors Buildings and Grounds Committee. 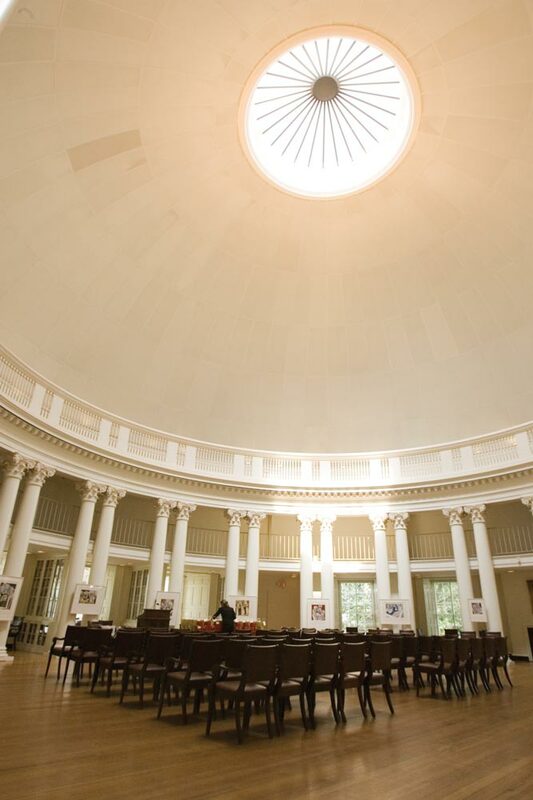 The draft possibilities for the Rotunda include more student class and study use, a Dome Room lecture series, extended hours of operation and opening the main door at the top of the stairs leading to the Lawn. "Certainly [we've thought about] having more class activities in here, as well as extended hours for study, or for 'flash seminars,'" Neuman says, referring to one-time sessions where students and faculty discuss current events and ideas. "And then there's been discussion about maybe a 'University Professors' lecture series in the Dome Room, four to six lectures a year that would be very well touted. To do that, though, you would want to improve the audiovisual capabilities in the Dome Room. The acoustics aren't good, one can't really project images well in there," he notes, "But we can solve those problems." The concepts for future uses along with estimated costs will soon be presented to the full Board of Visitors. 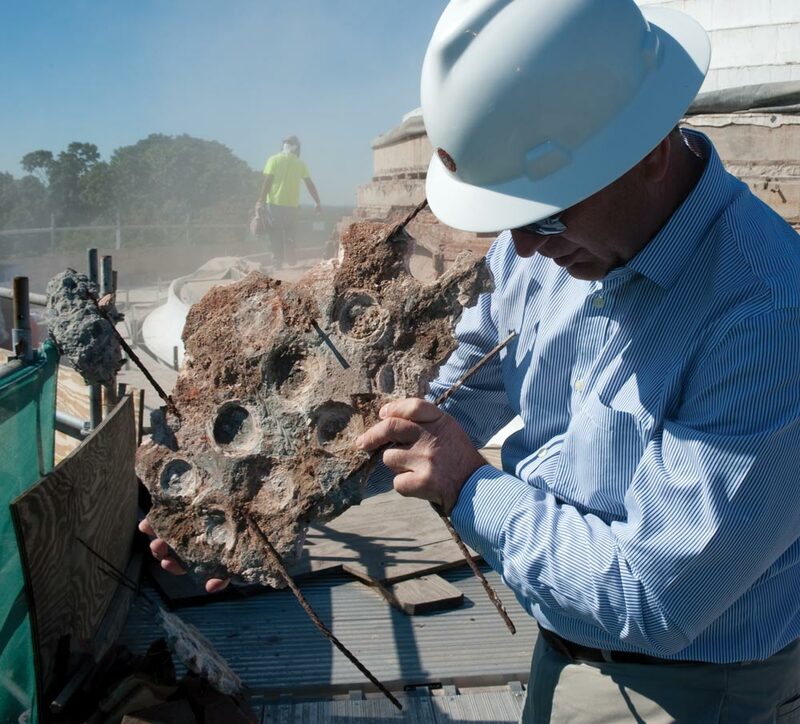 Until then, workers on the Rotunda roof are grinding masonry and concrete, noisily reshaping the exposed step pattern around the base of the dome and sorting through debris uncovered after the removal of the 1975 steel roof. The intact Guastavino tiles found under the steps will be reused in the repair of the inner and outer domes. White's skylights will be archived. Even the 1970s Budweiser cans found under the roof are set aside, not carted away with the rubble. The salvaged pieces will be stored in the Office of the Architect's warehouse space on Millmont Street, overseen by Mark Kutney, the University conservator. In the spirit of the HSR, the historic planners involved with the Rotunda renovation project, John G. Waite Associates, are keeping careful records of what's uncovered, what changes, and the differences between what was in the plans and what exactly happened in the previous renovations. But determining the exact fate of the archaeological salvage won't be Stephen Ratliff's job. He joins the line of those who came before him, overseeing the construction and working to preserve and to honor this building. As the latest efforts unfold around him, he works his way up the scaffolding to the dome roof. He picks through bits of mortar to find a purple pane, an ethereal remnant of renovations past, and holds it up to the sun, finally letting the light shine through. Jefferson writes to William Thornton, first architect of the U.S. Capitol, and to Benjamin Latrobe, who had been surveyor of public buildings during Jefferson’s presidency, soliciting sketches of “general outlines of designs” for a building at the north end of the Lawn. Both suggest a central, prominent building. Latrobe suggests the dome. The drum of the Rotunda is built in 1823 and allowed to settle for nearly a year before the dome is installed. 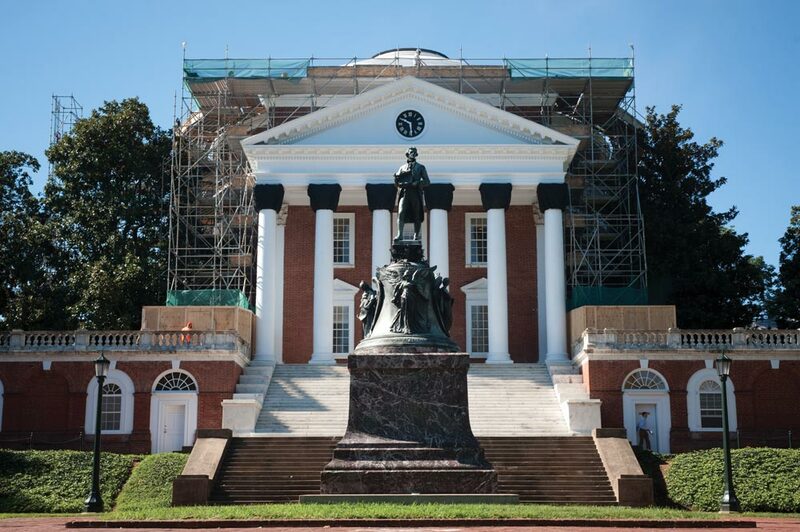 Jefferson dies; construction of the Rotunda is nearly complete. The Annex is built on the north side of the Rotunda to provide more classrooms for a growing student body. 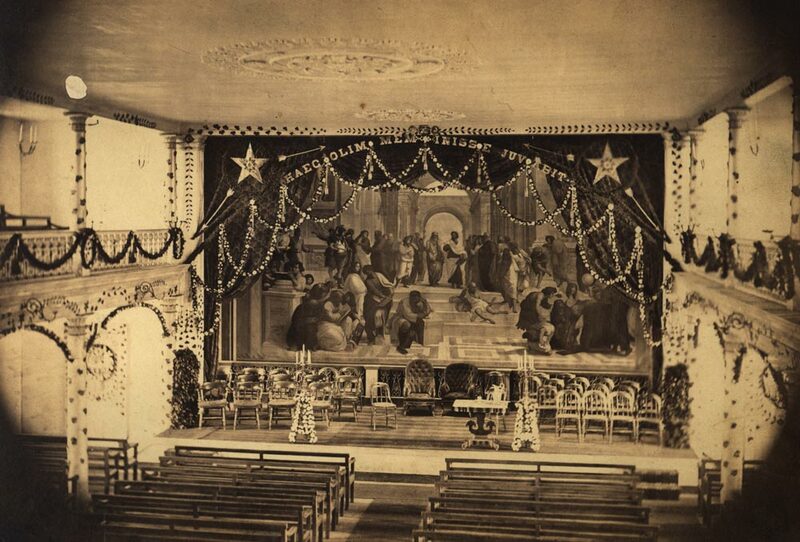 The decorated public hall in the Annex. Paul Balze's copy of Raphael's "School of Athens" painting in the background was later lost in the 1895 fire, along with the rest of the Annex. The Annex and most of the Rotunda are destroyed by fire. The Annex is never rebuilt, but the wide terraces in front of the north portico are built over what is called the Ramparts—its ruins. 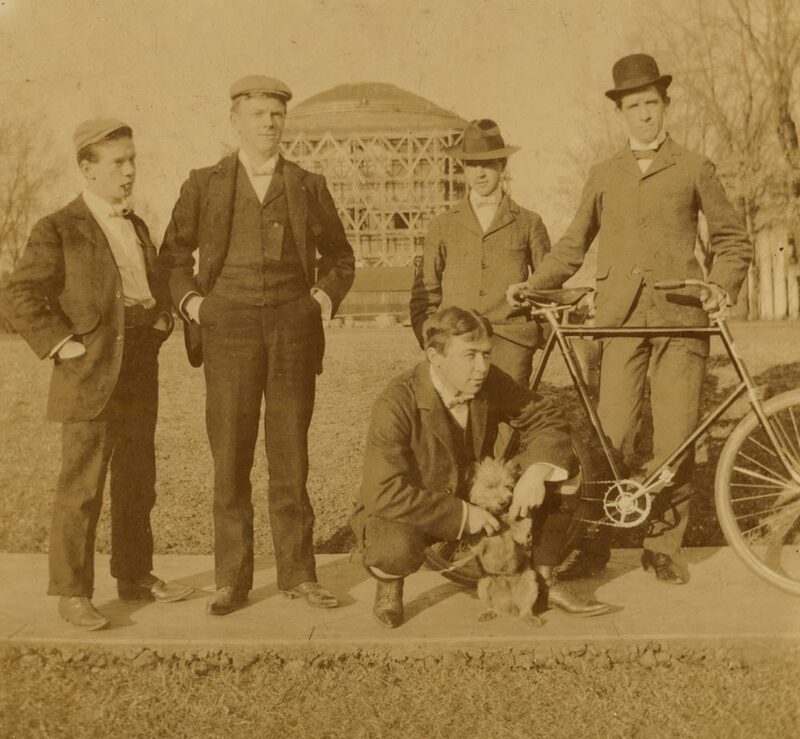 A group of students pose in front of the south face of the Rotunda, which is covered in scaffolding during the McKim, Mead and White reconstruction in 1896 (from the Turner Family). Another view of McKim, Mead and White reconstruction a year later (below left) and a view from the north of the Rotunda during reconstruction (below right). The rubble in the foreground is from the ruined Annex. McKim, Mead and White redesign the Rotunda in the Beaux Arts style, characterized by heavy use of classical detail and ornamentation. 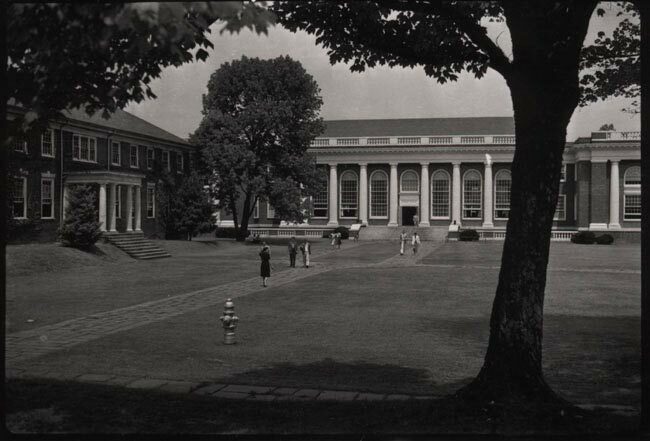 The firm adds a north portico and terrace, increases the height of the library by removing a floor, and adds steel walkways around the upper stacks, in part to accommodate the growing library collection. The library is moved to Alderman, and the Rotunda loses its main purpose. Professor of architecture Frederick Nichols begins working on restoring Jefferson’s interior plan. Below, left: Workmen on Dome Room scaffolding during the 1974 renovation. Above, right: Nichols’ plan eventually leads to a massive renovation that completely guts the interior and replaces the roof. “Nichols observed in a 1976 University of Virginia Magazine article that when he opened the debate in 1955, the University community had only known the Stanford White-designed interior. Nichols’ idea was to return to Jefferson’s architectural and philosophical ideas for the Rotunda as a center of student and faculty life. Phase One of the current Rotunda renovation project begins. Roof: The existing steel roofing, coated in an alloy of lead and tin called terne, will be replaced with copper roofing that will be painted white. The bottom two masonry steps on the Rotunda roof will be removed and later reconstructed to allow repair of a rusted tension ring from the 1890s. Minor repairs are being made to the Guastavino tile system on the dome roof. A new aluminum oculus will have more ribs of a narrower dimension and will be finished white, inside and out. The type of oculus originally installed is not known, but the Office of the Architect believes this new aluminum oculus is similar to the original one chosen by Jefferson. Masonry: Exterior brick walls and windows will be repointed and repaired. Ornamental work: All of the white ornamental work on the Rotunda, is actually made of copper. “We have precedent, historically, for painting copper. It’s a great metal because it doesn’t deteriorate the way that metal that has iron in it does, so it’s been used as architectural ornament for hundreds of years,” Brian Hogg says. The white paint has been stripped so the ornamental work can be repaired. 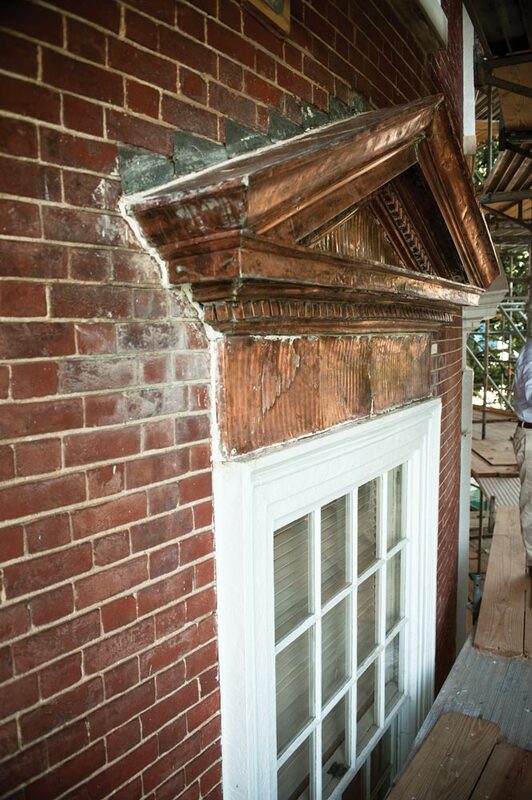 Porticoes: The leaking Rotunda roof and the 1970s HVAC system have caused the porticoes’ 1890s steel frames to rust. Each portico roof will need to be peeled off and repaired. 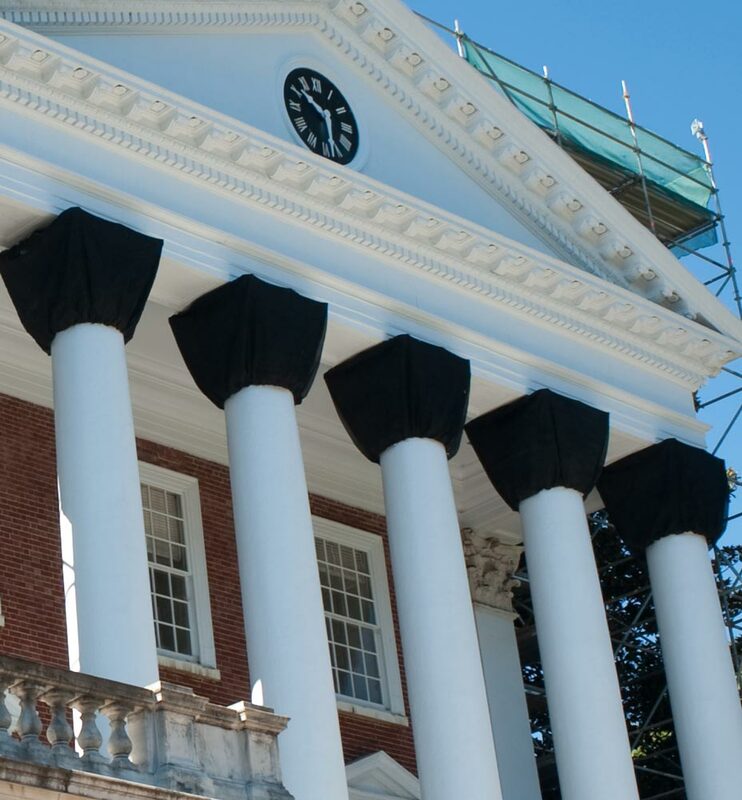 Capitals: The Rotunda column capitals, currently shrouded in black netting to keep crumbling debris from falling on passersby, will be replaced. Jefferson’s column capitals were built from Italian Carrara marble, but the 1890s post-fire capitals were made of marble from New England because it was the least expensive option, though it was of inferior quality. Additional work: Stairs, balustrades and the Rotunda elevator will be repaired, and all the brickwork on the wings will be repointed. Crews will repair and replace the mechanical, electrical, plumbing and HVAC systems. New fire detection and suppression systems will be installed, the air distribution in the Dome Room will be reconfigured, the Dome Room ceiling panels will be replaced with acoustical plaster that will create a seamless, more aesthetically pleasing ceiling, and the wood column cracks in the Dome Room will be repaired. Audiovisual improvements will be made in the Dome Room, including the installation of an oculus retractable blind to improve Dome Room video quality. Repairs will be made to the damaged north terrace. The north and south passageways through the north portico wing will be restored, and the courtyards will be improved. * Editor's note: We stated incorrectly that the skylights turned a lavender color “from years in the dark.” Instead, the glass was originally clear and darkened after being exposed to light due to its chemical content. Historians are unsure of how long the glass was exposed to light, but they presume it was for at least a year or so after it was initially installed, then again during the 1976 renovation. We regret the error. Are any of the glass pieces for sale and if so where can I find one.